Tableau is a great tool for creating data analysis and visualizations. Each worksheet you create focuses on a specific analysis, and the dashboards you create enable you to combine several worksheets into an interactive group. Often, workbooks containing worksheets and dashboards are all you need to understand and even share those analyses. Unfortunately, understanding complex analyses can sometimes be difficult or confusing for people who didn’t have a hand in doing the actual analysis. You might be presenting great information, but without a little help, viewers might miss the important points or even misinterpret the information and draw incorrect conclusions. 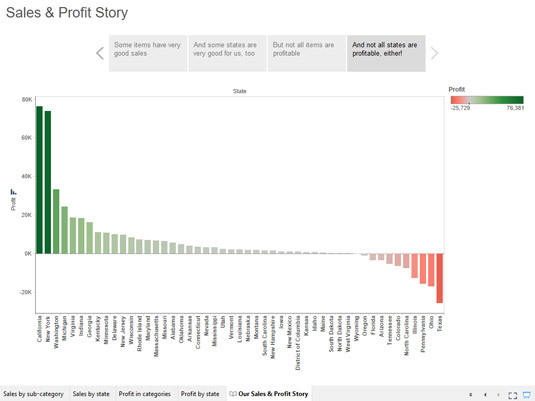 To get an idea how a Tableau story can help you expose findings for other people, let’s take a quick look at a simple story that tells the tale of sales and profits across a range of items for your stores across the country. 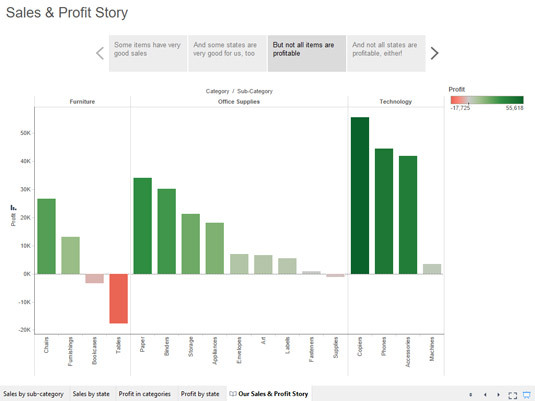 Adding a new story in Tableau is as simple as adding a new worksheet or a new dashboard. At the bottom of your screen, click on New Story, just to the right of New Dashboard. Then simply drag the view you want and give it a caption. Continue in this manner until you have built out a story. Here is the first story point that you need to know: how sales across different sub-categories of products rank against each other. Clearly, certain items like phones and chairs seem to be resulting in quite a bit of sales. Our first story point tells about sales in various subcategories. Next, the second story point shows that a few states, such as California and New York, are enjoying quite good sales. So far, this example gives the viewer pretty good news about a few of the items for sale and a few of the places these items are sold. 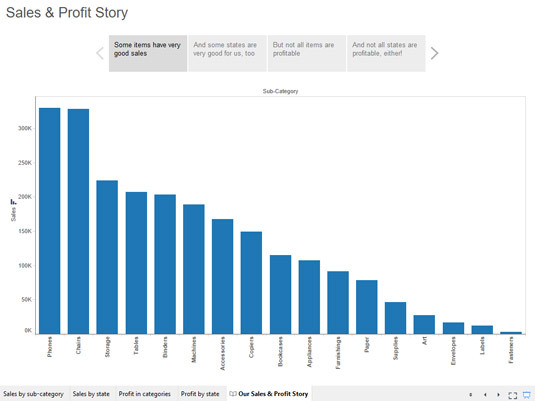 Our second story point tells about sales in various states. Unfortunately, moving onto the third story point shows that profits are not being made on everything that is being sold. In fact, our fourth-highest sales volume item (which happens to be tables) is actually losing money in a fairly substantial way. Check out this third story point. Our third story point shows that good sales don’t always mean good profits. Finally, the fourth story point also displays some disturbing news. Texas, the state with our third-highest sales, is also where the most money is being lost. 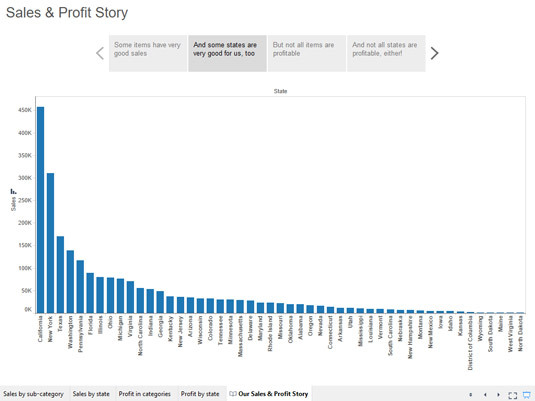 Our fourth story point shows that some states aren’t very profitable. Even though this story was intentionally kept very simple, it does demonstrate that you can use Tableau stories to guide people through the important points of your analysis. The viewer doesn’t need to know anything about using Tableau and he or she certainly doesn’t need to be an expert in data analysis.